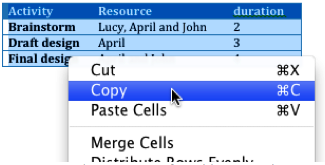 You can import Excel, MS Project, CSV (comma delimited) and JSON files or you can copy and paste tables from for instance Word documents or webpages into Tom’s Planner. You can export your schedule to MS Project, CSV, JSON, Excel, PDF or an image file. To import or export files just click the ‘Import & Export’ button on the toolbar. If you choose to import a MS Project file you will be asked to upload a Microsoft Project file (the file with the ‘mpp’ extension) and it will automatically be opened in Tom’s Planner as a new schedule. 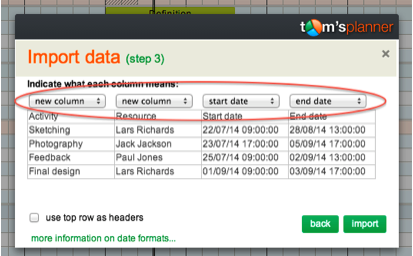 Step 1: Copy the contents of your excel document into Tom’s Planner. 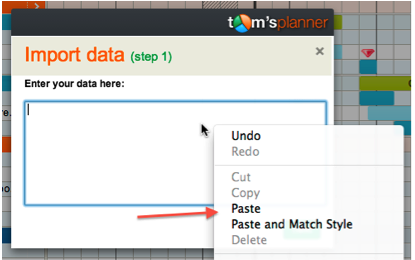 Step 2: After you have pasted the data into Tom’s Planner you will be asked if you want to create a new schedule with the imported data or if you would like to add it as a new group to your existing schedule. Step 3: In the third step you can match the different columns in your spreadsheet with the columns in your Tom’s Planner schedule. Tom’s Planner will make a best but do review these settings. Results might vary from table to table and depends on the way the tables are formatted by the author. If you run into any problems be sure to contact us at support@tomsplanner.com. Importing CSV files is the same as importing Excel files. However you will be able to upload your CSV file directly instead of having to copy/paste the file contents into the tool. Your schedule will be exported to a xml file which can be opened in MS Project. More details on the export to PDF and Image files can be found on page 25 in the chapter on printing.